The American epinephrine autoinjectors ordered by Health Canada as an emergency measure amid an ongoing EpiPen shortage have been priced at $ 170 Cdn each by manufacturer Kaléo Pharmaceuticals, CBC News has learned. Since 2015, Pfizer Inc. — EpiPen's manufacturer — has been the sole supplier of epinephrine autoinjectors in Canada. They are life-saving devices for people who have an anaphylactic reaction to something they're allergic to, including food, and patients are usually supposed to have more than one of them. Schools, for example, often require that children at risk of anaphylaxis have an injector in the classroom. But Pfizer has repeatedly announced shortages, and over the last several weeks, Canadian pharmacies have had to ration EpiPens, dispensing only one per patient. That led to a great deal of concern as the school year approaches. 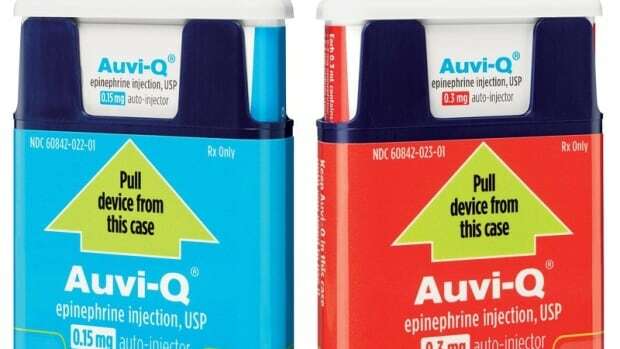 On Wednesday, Health Minister Ginette Petipas Taylor announced an "interim order" allowing the Auvi-Q injectors to be imported from the U.S. and sold in Canada for up to one year. The devices have been approved by the U.S. Food and Drug Administration, and will be available in Canadian pharmacies by Sept. 7. That price for the Auvi-Q epinephrine autoinjector is more than the price of an EpiPen, which costs about $ 100 before pharmacy dispensing fees. But it's far less than product's retail price in the U.S. of about $ 460 Cdn. "When setting the price for Auvi-Q in support of Health Canada's efforts to develop an alternative supply of epinephrine autoinjectors, Kaléo took many factors into consideration, including product safety, product features, market dynamics and, most importantly, patient access," said Mark Herzog, the U.S.-based company's vice-president of corporate affairs, in an email on Friday. But although that's the amount Kaléo will charge its Canadian distributor, the end cost to to patients or their insurers may vary, Herzog said, "depending on insurance coverage by province, pharmacy markups and other factors in the distribution system in Canada." Kaléo says it hopes to sell its autoinjectors in Canada permanently, which would end Pfizer Inc.'s monopoly — something families with allergies and Health Canada have said is needed to protect against future shortages. If Kalé​o is granted a permanent approval in Canada, Auvi-Q will be sold under the name of Allerject starting in 2019. Some Canadians may be familiar with that name — Allerject was previously manufactured by Sanofi, but was recalled in October 2015 amid concerns they could potentially deliver an inaccurate amount of epinephrine. Auvi-Q and Allerject differ from the EpiPen in that they have a retractable needle and an electronic voice instruction system to guide users through each step of the injection. In addition, "enhancements … have been made to the manufacturing and quality systems that require approval by Canadian authorities," he said. It's not yet clear how much Allerject will cost if it is sold in Canada permanently. The $ 170 price tag for its Auvi-Q counterpart only applies to the temporary time period set by the health minister's interim order. It's also unclear whether yet another company may start selling epinephrine autoinjectors in Canada — potentially turning a single-supplier market plagued by shortages into a three-way competition. According to Health Canada's drug product database, Bausch Health Companies, formerly called Valeant Pharmaceuticals, has approval to market Emerade, an autoinjector currently available in several European countries. In an emailed statement to CBC News in early August, spokesperson Lainie Keller said, "We are actively seeking to bring Emerade (adrenaline tartrate) to patients in Canada who need it as soon as possible." When asked on Thursday if Kaléo's entry into the Canadian market would affect Bausch Health's decision, Keller said, "our comment still stands, and we have nothing new to add at this time."